I haven’t done Teaser Tuesday for a while now, and since I have no reviews to write yet, I thought I’d do one! 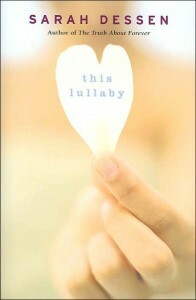 This week is an oldie but goodie book, This Lullaby by Sarah Dessen. As I mentioned in my last IMM post, I suddenly felt like picking up YA contemporary romance in the light of my brother’s wedding last week. I needed something that really tackled love, and I realized that my TBR pile does not have any! Gasp. I have started storing too many fantasy/dystopia books and too little of the contemporaries! So I decided to pick up an old one instead, and I realized that it’s been a while since I last read a Dessen book. And This Lullaby seemed the best one on the topic. Don’t you think? When it comes to relationships, Remy doesn’t mess around. After all, she’s learned all there is to know from her mother, who’s currently working on husband number five. But there’s something about Dexter that seems to defy all of Remy’s rules. He certainly doesn’t seem like Mr. Right. For some reason, however, Remy just can’t seem to shake him. Could it be that Remy’s starting to understand what those love songs are all about? My teaser comes from somewhere in the last part of the book, but don’t worry, no spoilers! Ah. That was one of the lines I noted back when I first read this book. I’m not a fan of musicians but I like songs about love, too. I’m sure Dex’s band also has a bass amp at Musicians friend. Review for this book coming soon. :) Care to share your own teasers? I am not much into romance these days, but that’s a nice quote! That’s a really compelling teaser…thanks! This sounds good–great teaser! For romance, my favorite author is Lavryle Spencer. I get the impression that I really need to read Dessen! My teaser is here this week. I love these quotes you shared. I’m a huge romance book reader and this book sounds right up my alley. Onto the TBR pile it goes. Great teaser choices. I have a few Sarah Dessen books on my shelf waiting to be read. My niece loves them! Second recommendation I’ve seen today for “Shades of Gray.” I am going to have to give it a look! And I love Sarah Dessen. My Tuesday Teaser is from “Rain Dance,” a work of Christian fiction — if I have to pigeon-hole it and I don’t necessarily like doing that — which takes a look at abortion, friendship, choices … real life! As I’ve long known from my own life, women can be friends and have deep friendships with other women who don’t agree with them on many matters, including abortion and politics! Not everything in life has easy answers, and that book showcases that thought. [[Later, as I considered the high cost of friendship, I realized that even in her hurt and anger, she didn‟t blame God. Her religion wasn‟t a surface thing. It seemed ocean deep. Nice teaser! Hope you enjoy the book. My teaser is at The Crowded Leaf. I hate that MOTHER she’s a….. Nice teaser I think Remy is trying to play safe. Have fun! gerat teaser. I love Sarah and her books. Do visit my site, my post announcing the winner is up tomorrow. I am also emailing you, so we can do the Book Depo certificate thing! !